Dr. Hataley, who has been outspoken about wait times and other issues plaguing Ontario’s health care system, said the wait time “shocked” her. 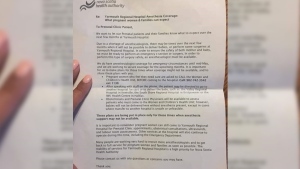 She wanted to shock others as well, so she tweeted a photo of the letter and tagged Ontario Health Minister Eric Hoskins and Kingston-area MPP Sophie Kiwala. Wooldridge said she will continue to live with chronic pain and be cared for by Dr. Hataley until she can see a neurologist. She said she shouldn't have to travel outside of Kingston to see a specialist. Dr. Hataley said travelling for health care can come at a considerable cost to a patient, and many people are unable to make such trips. Dr. Hataley said wait times to see neurologists in Kingston are notoriously bad. But she said the problem is not confined to a particular neurologist or even that field of medicine. In her nearly 20 years of experience working in family practice, operating rooms and emergency rooms, she has had countless discussions and meetings with government officials and other health care providers about wait times. And they all seem to be going nowhere, she said. In a statement to CTVNews.ca, Dr. Fitzpatrick said hospital officials are working to address the problem, and noted that urgent cases are always prioritized. He said wait times vary across medical specialties and even within specific fields, such the neurology sub-speciality of movement disorders, where Dr. Hataley’s patient was referred. Dr. Fitzpatrick said that only a small number of specialists in Ontario treat patients with movement disorders. 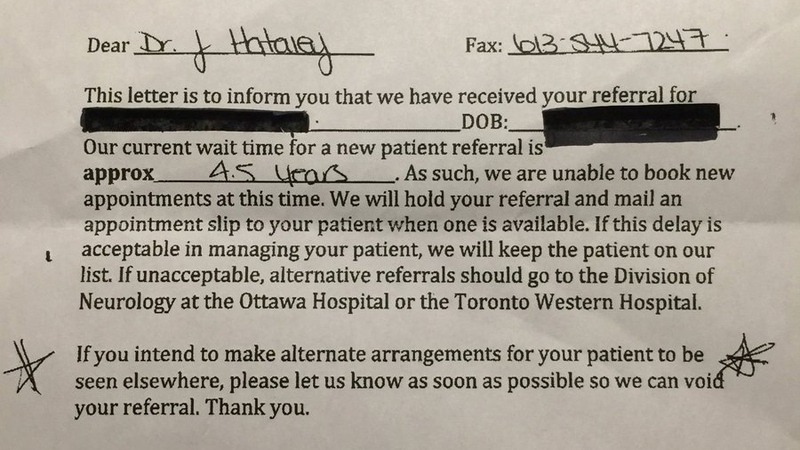 Ontario Medical Association President Dr. Shawn Whatley said it’s “deeply concerning” to see wait times like the one Dr. Hataley highlighted. He said the OMA has been raising the alarm about long wait times for all kinds of health care services for years. In his own small-town practice, Dr. Whatley said it’s usually a two-year wait for patients who need joint replacements, for example. When patients have to travel outside of their towns and cities for medical procedures, “it’s a huge burden on the patient, huge burden on the family,” Dr. Whatley said. And medical literature shows that, despite Canada’s universal health care system, long wait times disproportionately affect low-income Canadians because they don’t have the financial means to travel, he added. Dr. Hataley said the health care system is still “really good” at emergency care. But, while an “overwhelming” amount of health-care dollars goes to front-line care, there aren’t enough resources devoted to ensure patients who develop new or chronic illnesses are seen by specialists in a timely manner. “We talk about (wait times) ad nauseam. We’re in trouble, we all know it. Now let’s get to work,” she said. Dr. Hataley said improving the relationship between the provincial government and health care providers should be one of the first steps in addressing the wait-time crisis. The Ontario Ministry of Health did not respond to CTVNews.ca’s questions about wait times by publication time, but the provincial government tracks and publicly displays wait times for certain types of surgeries and medical procedures, including hip and knee replacements and cancer surgeries. According to a 2016 Commonwealth Fund survey of people in 11 developed countries, Canadians reported the longest wait times to see specialists. Fifty-six per cent of Canadians surveyed said they waited longer than four weeks to see a specialist, compared with the international average of 36 per cent. The same report found that less than half of Canadians could get a same or next-day appointment with their family doctor, and only one in three had access to after-hours medical care. Earlier this year, the Healthcare Access and Quality Index published in The Lancet medical journal placed Canada 17th when it comes to death rates from diseases that are normally considered treatable. Dr. Joy Hataley said she was shocked when she received this letter from a neurologist's office.